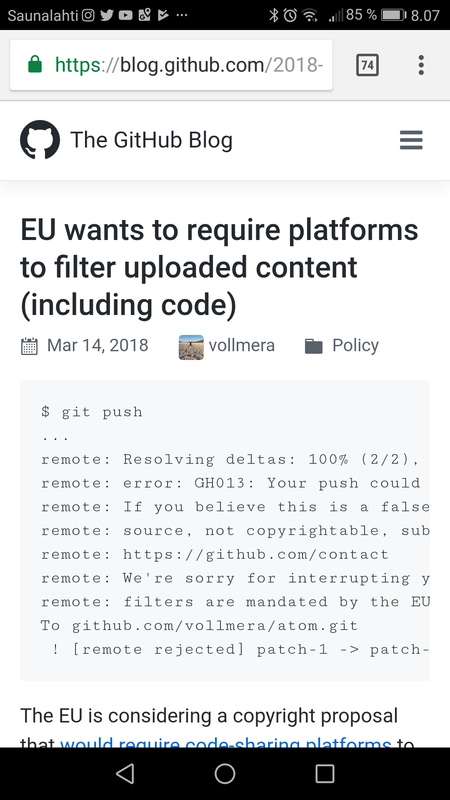 The EU is considering a copyright proposal that would require code-sharing platforms to monitor all content that users upload for potential copyright infringement (see the EU Commission’s proposed Article 13 of the Copyright Directive). The proposal is aimed at music and videos on streaming platforms. However, the way it’s written captures many other types of content, including code. Upload filters (“censorship machines”) are one of the most controversial elements of the copyright proposal, raising a number of concerns. Current EU Copyright Reviewthreatens Free and Open Source Software. Take action now to preserve the ability to collaboratively build software online! GitHub says the introduction of security alerts last year has led to a significantly smaller number of vulnerable code libraries on the platform. The code hosting service announced in mid-November 2017 the introduction of a new security feature designed to warn developers if the software libraries used by their projects contain any known vulnerabilities. When it introduced security alerts, GitHub compared the list of vulnerable libraries to the Dependency Graph in all public code repositories. The Dependency Graph is a feature in the Insights section of GitHub that lists the libraries used by a project. Since the introduction of security alerts, this section also informs users about vulnerable dependencies, including CVE identifiers and severity of the flaws, and provides advice on how to address the issues.